Three Sectional Black Wood Staff With Ball Bearing Swivel | BUDK.com - Knives & Swords At The Lowest Prices! 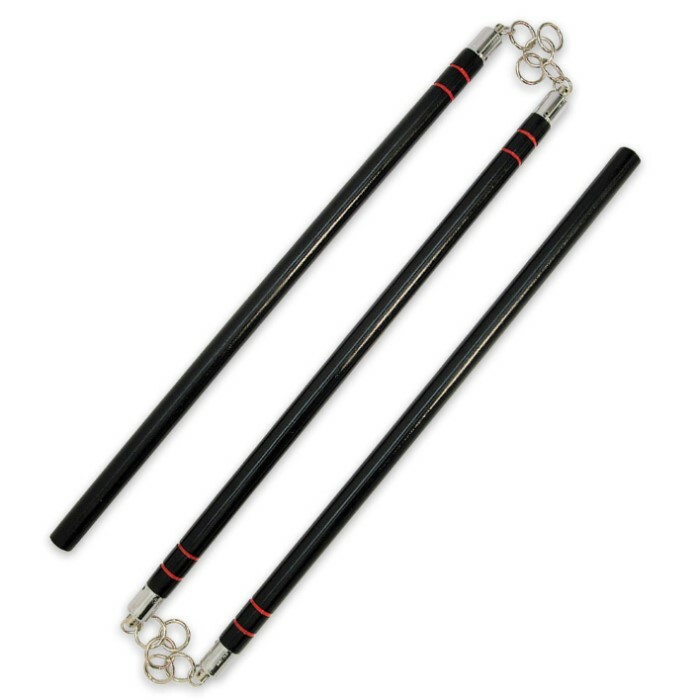 Perfect for martial arts use, the 3 Sectional Staff Black Wood with Swivel is an attractive looking staff that is sure to "Wow" at your next event. It is made of attractive black wood with red stripes as accents and it features a ball bearing swivel. Metal links connect the three sections. It measures 26" in overall length. This is the same design from the movie "36 chambers of the Shaolin" 38 years ago. This weapon is fun to use but deadly to anyone who masters it this is a great weapon for the price. the cain seems good holds pretty well the red it like tape or something like that. nice and sturdy wood and the sections holding the wood are like most nunchukes and go 360 spin very well and there isnt the rings like the picture showers. but in all besides the red tape and not same chain.